Where your country and my country eat together. Dieu Ngo and Tony Torres serve tacos, banh mi, and a number of unique Mexican-Vietnamese fusion dishes. Hours: Thu.–Tue. 8:30 a.m.–7:30 p.m. In Oakland, a lesson in cross-cultural communication might come in the form of a political protest, a mural graffitied on the side of a shipping container, or a poetry lesson at a local high school. 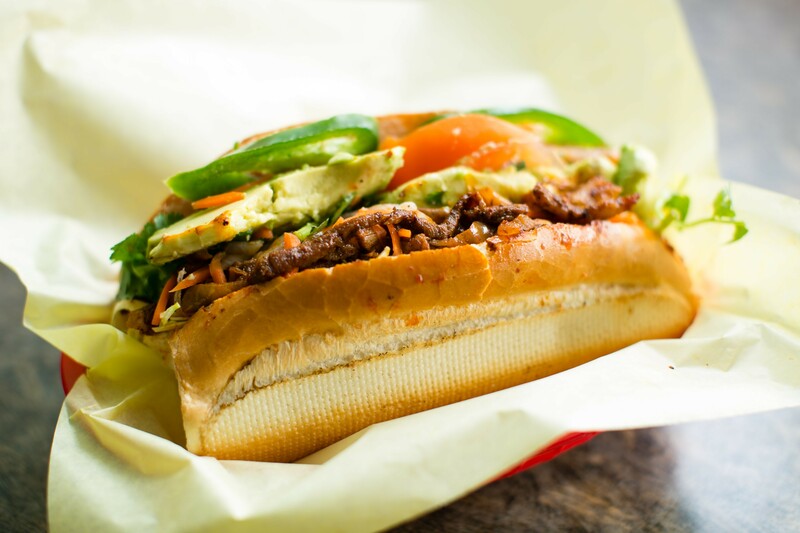 Or it might come in the form of a sandwich — say, the amazing al pastor banh mi at East Oakland's Saigon Deli Sandwich & Taco Valparaiso, which is probably the only combination banh mi shop and taqueria in the Bay Area. Certainly, it's the only restaurant I know of where you can eat al pastor-style pork not just on a taco, but also inside a crunchy banh mi roll loaded with all of the usual Vietnamese sandwich condiments: fresh cilantro, sliced jalapeno, and matchsticks of sweet pickled carrot and daikon radish. Ladled overtop: a splash of potent, if deceptively slow-burning, red salsa. But Saigon Deli's origin story may be even more unlikely than the mixing of Vietnamese and Mexican cuisines. In 2011, co-owner Dieu Ngo, a Saigon native, opened the little banh mi shop in an East Oakland strip mall anchored by a busy laundromat after having spent more than a decade making sandwiches at nearby Banh Mi Ba Le. 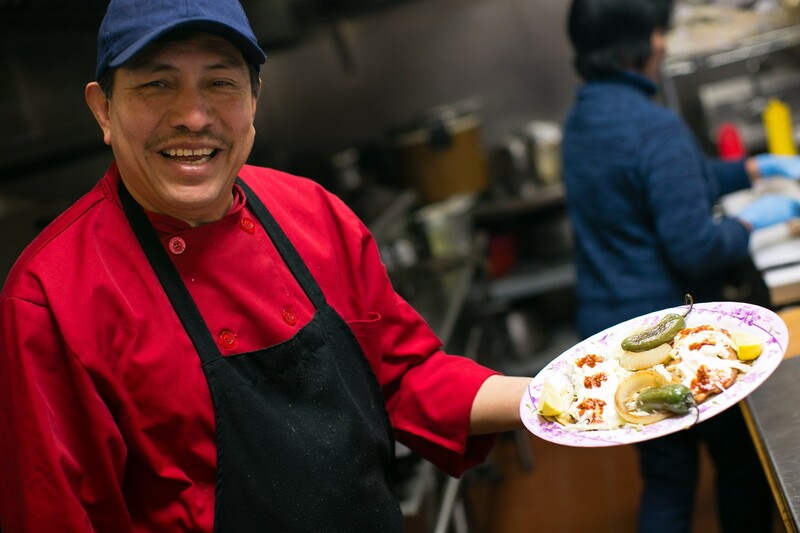 For the first few months, Saigon Deli was strictly a Vietnamese restaurant, but then Tony Torres, a longtime customer from Ngo's Ba Le days, approached her with an intriguing proposition: What if the two of them joined forces? At the time, Torres was managing a Sizzler part-time while also running a taqueria he'd opened in Monterey County in 1996 — the original Taco Valparaiso. 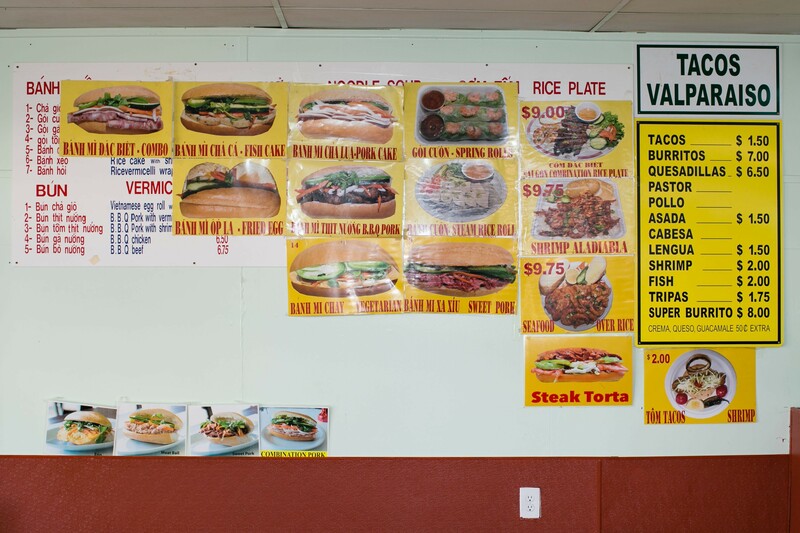 At Saigon Deli Sandwich & Taco Valparaiso, a banh mi menu occupies the left side of one of the restaurant's walls, while a fairly traditional taqueria menu occupies the right. On its face, the idea seemed crazy to Ngo, who said she didn't even know how to eat a taco, let alone make one. But Torres, who grew up in the Mexican state of Zacatecas, was convinced that the shop's location in the San Antonio neighborhood, halfway between Chinatown and the Fruitvale district, was the perfect place. Now, a banh mi menu occupies the left side of one of the restaurant's walls, while a fairly traditional taqueria menu occupies the right. A small placard on the table reads, "Where Your Country and My Country Eat Together." Taken on their own, the tacos and banh mi are good enough to recommend — though perhaps not more so than the ones at any number of other similarly down-home Mexican and Vietnamese joints that you can find up and down International Boulevard. Banh mi dac biet — the classic combo sandwich, with its layers of head cheese, cold cuts, and pâté — is the measuring stick that most expert banh mi eaters use to judge a Vietnamese sandwich shop. Ngo's is solidly above average. Its only noticeable flaw, really, was that the bread was a tad bit too crunchy and dry. Meanwhile, Torres' array of standard tacos all featured juicy strips of well-caramelized grilled onion, and a generous scoop of his bright-red "special salsa" — the smoky, pleasantly bitter hot sauce that Torres makes with dried chile de árbol. But the meats were hit or miss — the beef lengua (tongue) was wonderful; the al pastor was rich and intensely savory, if a bit too salty; and the tripas (crispy pork intestines) were too hard and over-fried. Where the magic happens is in the more fusion-y dishes, most of which Torres invented in the years since he began his collaboration with Ngo. In banh mi form, the al pastor has its saltiness balanced by the sweetness of the Vietnamese pickles, and by the fact that all of the extra sauce gets soaked up, deliciously, by the sturdy bun. Ask for an extra tub of the salsa: The extra hit of complex heat put the sandwich over the top. My favorite dish was the shrimp a la diabla rice plate, which takes the traditional Mexican shrimp preparation — whole shrimp sautéed in a fiery-red sauce adjusted to your preferred level of spiciness — and serves it, counterintuitively, over a plate of Asian-style white rice, so that the dish recalls the kind of saucy tomato-and-shrimp stir-fry you might get at any number of Chinese or Vietnamese restaurants. The sauce had an earthy funk that I swore must have come from the inclusion of the shrimp-head juices (a staple of the Asian versions of this dish), but Torres said no heads were used — just lots of aromatics and dried chilies. The shrimp came with more of those pickles, plus a couple wedges of toasted French bread, so if you wanted to, you could make your own little makeshift banh mi. Later, Torres told me that while they aren't listed on the menu, you can, in fact, order a shrimp a la diabla banh mi, a fried-fish banh mi, or a carne asada banh mi. 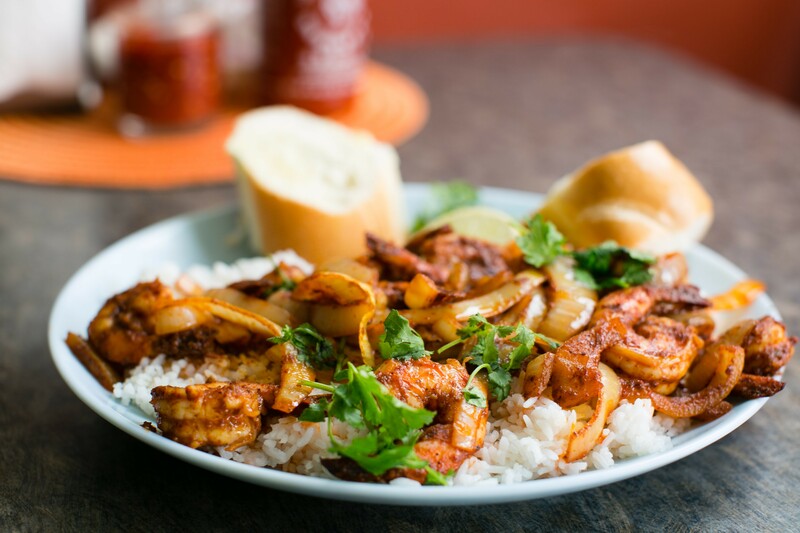 Shrimp a la diabla, Asian-style. If Mexican-Vietnamese fusion isn't your thing, the traditional side of the menu offers a number of pleasant surprises as well. Of the traditional tacos, the surprise winners were the ones featuring fried seafood. Topped with shredded cabbage, Torres's fried fish tacos were a variant on the Baja style, though Torres said the mayonnaise-based "creamy cheese sauce" he uses is a little bit different, as is the salsa, which has a tangy note that comes from the addition of a small number of tomatillos. The fish inside the tacos I tried was fried to perfection, with just the right blend of crunch and tenderness, of tongue-searing heat (both spice-wise and temperature-wise) and cooling cream. And if anything, the shrimp taco, served in a similar style — with several whole shrimp fried together to form one big, batter-fried "fritter" of sorts — was even better. Both fish and shrimp are so generously portioned that the seafood barely fits inside the corn tortillas. You wind up having to hold the whole thing flat and eat it like an open-face sandwich. 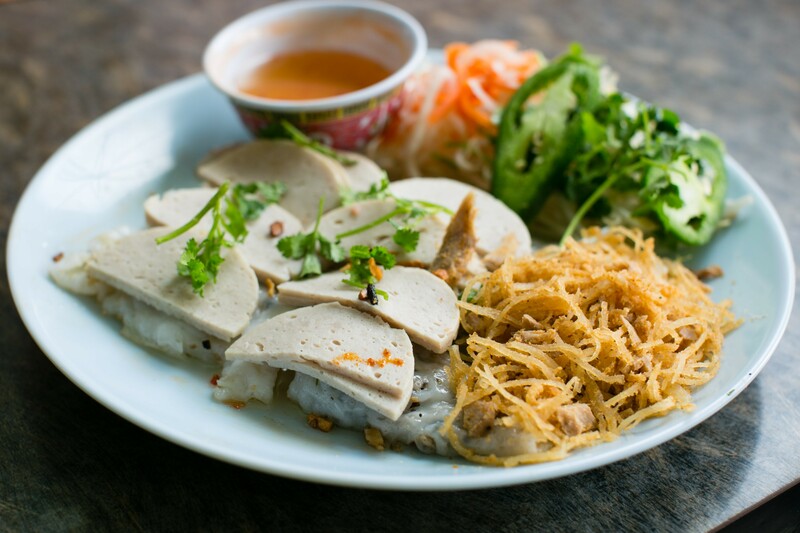 On the Vietnamese side of the menu, you won't find many banh mi shops that serve banh cuon, a kind of Vietnamese steamed rice roll that's filled with mushroom-studded pork — certainly not one that's as delicate and satisfying as Saigon Deli's. Of course, part of the charm of the restaurant is that you can order all of this food in the same meal: fish tacos and banh cuon, a burrito washed down with Thai iced tea. Saigon Deli Sandwich & Taco Valparaiso's Banh Cuon. Even without the hybridized element, Oakland's taquerias and banh mi shops are some of the city's truest hubs of diversity — where Blacks and whites, Asians and Latinos, hipsters and techies, high school kids and elder immigrants all come together in the universal pursuit of an inexpensive lunch. At Saigon Deli & Taco Valparaiso, that melting pot of class and culture is even more pronounced: One afternoon, I watched an older Latino man chatting away on his cellphone in Spanish while feasting on a hefty com dac biet (Vietnamese combo rice plate) topped with grilled pork, a fried egg, and what Torres later told me was a non-spicy version of his a la diablo-style shrimp. If all this wasn't reason enough to be charmed, the story of Saigon Deli Sandwich is also, at its heart, a love story. You see, Torres and Ngo were just friendly acquaintances when they first contemplated the possibility of opening a business together. Now, four years later, they're a couple, too — or, as Torres quipped, they're at least "getting there." I wondered if there had been some specific moment when they'd fallen for each other — perhaps in the kitchen while Torres was teaching Ngo his salsa recipe, or while Ngo was demonstrating the proper way to assemble a banh mi. But, according to Torres, there had been some inkling of romantic interest even prior to opening the restaurant. As he put it, "I closed one eye, she closed one eye." After that, they both just knew. Little by little, Torres said, the two have gotten to know each other, though they can only communicate in English, which is neither's first language. And, little by little, they've learned to love each other's food as well. "So far it's been beautiful," Torres said. Tony Torres, a longtime customer of Banh Mi Ba Le, approached Dieu Ngo with an intriguing proposition.